James Keys, Black candidate for D6 Supervisor, endorsed by current Supervisor Chris Daly, places people before politricks ! District 6 Supervisor Chris Daly, champion of the “have-nots” in San Francisco for a decade, has passed the torch and endorsed James Keys, his longtime legislative intern and campaign coordinator, to be his successor. “James was by my side through my toughest battles,” Daly told Fog City Journal publisher Luke Thomas. Keys, 48, chairs the San Francisco Board of Mental Health, is president of Alliance for a Better District 6, an organization devoted to increasing participation in elections and government by low-income residents, and former program director for the San Francisco Senior Action Network, where he advocated and taught seniors to shape public policy to empower their lives. He is a member of the California Alliance for Retired Americans, Central City Democrats, Community Budget Reform Council, United Playaz, MacCanDo Track and Field Club and Single-Payer Now! In District 6, the densely populated center of San Francisco, tycoons look down from skyscrapers on streets teaming with people from every corner of the world, from richest to poorest – from homeless people and residents of single room occupancy (SRO) hotels to corporate barons, huge retailers and big developers, from whom Keys refuses to take campaign contributions. Among the many neighborhoods of District 6 are the Tenderloin, South of Market, North Mission, Civic Center, part of the Financial District, Union Square, Hayes Valley, Lower Polk, Lower Nob Hill, South Beach, Yerba Buena, Mission Bay and Treasure Island. mesha Monge-Irizarry: James, how long have you lived in San Francisco? James Keys: I have lived in San Francisco for 11 years. I was born in Oakland, so San Francisco is home to me. MMI: Can you tell us something that most people do not know about you? JK: Well, I have worked in the hospitality industry for over 25 years. During that time I picked up some impressive cooking skills! MMI: What do you feel differentiates you from other candidates in San Francisco’s District 6? JK: Being born here in the Bay Area and living here in San Francisco’s District 6 for over 10 years, I have seen this city go through tremendous changes. I managed the front office for District 6 Supervisor Chris Daly for over three years. Also, as a legislative intern, I worked with Supervisor Daly and his staff to create and advocate for legislation that came out of his office. I was able to write policy and resolutions for the supervisor. I handled all of the constituent issues that came into the office and was able to represent the office on many issues in the district, including mental health issues. I have practical experience where my opponents have none. MMI: I understand that you would be the first ever elected (not appointed) progressive African American male on the Board of Supervisors in the history of our city. How do you feel this is important to our community and to yourself? JK: I continue to hear from members of the community that African Americans are not properly represented in our local government. There are African Americans who live here and honestly want to see their candidate in office! MMI: What is your position on the Sanctuary City Ordinance that has been eroded for the past year, and what are the next steps to take? JK: There has been a lot of discussion regarding my answer about “Sanctuary City” for the SF Young Democrats. San Francisco, in 1989, under a voter-approved sanctuary ordinance, known in the Latino and laborers community as “Santuario,” provided a haven for undocumented immigrants. In 2008, Mayor Gavin Newsom even launched a taxpayer-funded $83,000 “public awareness campaign” assuring undocumented immigrants that this “Sanctuary City” by the Bay was their inherent protection. Under the voter-approved Sanctuary Ordinance, SFPD and other city employees are prohibited from inquiring into immigration status and San Francisco would not direct municipal funds or employees towards assisting federal immigration enforcement, unless such assistance is required by federal or state law or a warrant. We need the next steps to be a RETURN to Santuario! MMI: James, the word is out on the street that you are running a truly grassroots campaign. What does this mean, and how is it being achieved? JK: As the coordinator of the Daly ‘06 campaign, I have professional campaign experience. Otherwise, this is truly a grassroots effort. With volunteers alone working on this campaign, we have been able to submit over 1,000 “signatures-in-lieu” to the Department of Elections. Volunteers help shape fundraising drives, messaging and visibility events in this campaign. And these volunteers are SRO hotel residents, youth, seniors, low-income families, homeless people, disabled people, LGBT and people living with AIDS/HIV. MMI: While it has been demonstrated that you are a champion for the poor, the homeless, people of color, people who are differently mentally able, we often hear about the U.S.’ “disappearing middle class.” Bayview has the highest number of Black homeowners in the city, threatened by foreclosures and predatory loans. How do you plan to defend the rights of homeowners and small businesses? JK: It seems as though most people only “wake up” to the fact that there is something wrong when it occurs to them. The number of low- and middle-income residents in San Francisco is shrinking as the wealthy population swells, a trend most experts attribute to the city’s exorbitant housing costs. Yet there is a legitimate public policy concern when a city – that many people have lived in for many years and regard as their home – becomes so expensive they can’t afford to live there anymore. I will work towards placing people into jobs where they can receive on-the-job training while working and achieving affordable higher education, single-payer health care, a strong and fair labor movement and progressive immigration reform that will allow for the growth of low-income residents to become middle-class residents. MMI: What does “family values” mean to you as a progressive candidate? What’s the road ahead with the ban on Prop 8? JK: We all have our biological family – a father and mother and perhaps siblings. Yet we have grown as a people and understand that we can love anyone and everyone. And with that we have a “family,” and it is traditional, in that we share our responsibilities, our trust and our love with those we chose to share it with. As with all ignorance, we must teach by example and reach out to those who do not understand and show those who do not understand that love is love and the family will only become stronger. MMI: What is your position on 1) de-criminalization, 2) legalization, 3) taxation of cannabis? JK: De-criminalize it, legalize it and then tax it. Then utilize the revenue to create single-payer health care in California. MMI: Districts 6 and 10 in San Francisco as well as the Mission are the most criminalized neighborhoods of our city and often the stage of racially biased policing. What are you planning in terms of law enforcement accountability and transparency? JK: Car patrol eliminated the neighborhood police officer. Police were pulled off neighborhood beats to fill cars. But motorized patrol – the cornerstone of urban policing – has no effect on crime rates, victimization or public satisfaction. The reality is that the police largely react to crime and there is very little they can do to prevent it. Efforts in recent years to use community oriented policing, problem oriented policing and other strategies to address the conditions that lead to crime are one way that police departments with the resources have responded. Putting more visible police cars out on the street is politically popular because it makes people feel safer, but there’s little reason to believe crime rates are affected. Foot patrols will deter most “low-level” acts from occurring and instill a real sense of security in our neighborhoods. I will work with the SFPD and the community to expand foot patrols throughout San Francisco. 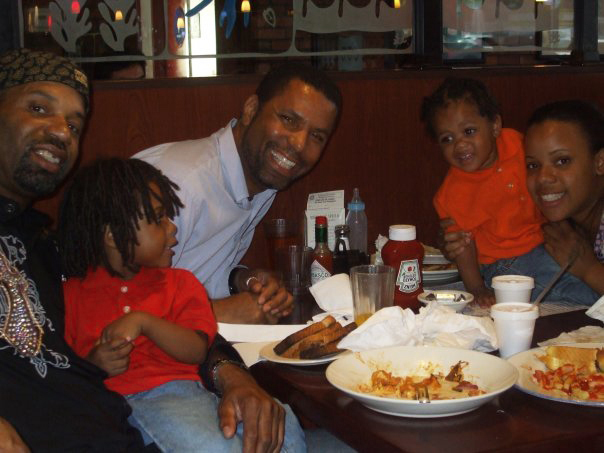 MMI: You wrote an open letter to Oakland Mayor Ron Dellums within 48 hours after the OPD-BART police killing of Fred Collins on July 17, 2010. Did you get a response? JK: Yes I did. I received a phone call from BART Police Chief Kenton Rainey and had a meeting with him in August 2010 regarding the San Francisco Mental Health Board training BART officers on “Police Intervention and Section 5150,” which is a section of the California Welfare and Institutions Code – specifically, the Lanterman-Petris-Short Act or LPS –which allows a qualified officer or clinician to involuntarily confine a person deemed to have a mental disorder that makes the person a danger to him or herself and/or others and/or gravely disabled. MMI: What is your commitment level about the cleaning of the Hunters Point Shipyard Superfund site and green issues? JK: San Francisco has my total commitment to cleaning our city and environmental problem sites. Yet we must make sure that the community has “equal say” in the process. MMI: I heard through the grapevine that you do not engage in candidates’ cat fights. How do you achieve this? JK: I would say that many of my opponents feel that I am “stand-offish,” yet many people have come to me any “had to tell me what so and so said about me.” To say I have not been disheartened by the “gossiper and the gossipee” would be a lie. So I chose to say as little as possible and continue forward. MMI: People tend to iconize, “messianize” politicians and city officials. How do you situate yourself along that trend? JK: I am a public servant and only through public consensus can we move forward. Political figures are not leaders. They are representatives and must listen to the concerns of all residents, mediate a middle ground and then work with their fellow representatives to make our home a better and healthier place to live. MMI: Any last word of wisdom, James? What is your “Do the Right Thing” campaign motto about? JK: Social justice is a concept that some use to describe the movement towards a socially just world. In this context, social justice is based on the concepts of human rights and equality and involves a greater degree of economic egalitarianism through progressive taxation, income redistribution or even property redistribution. These policies aim to achieve what developmental economists refer to as more equality of opportunity than may currently exist in some societies and to manufacture equality of outcome in cases where incidental inequalities appear in a procedurally just system. Political figures are not leaders. They are representatives and must listen to the concerns of all residents, mediate a middle ground and then work with their fellow representatives to make our home a better and healthier place to live. MMI: Way to go, James! Now I understand the depth of your mantra, “Do the Right Thing”! And totally get why you are endorsed by outgoing Supervisor Chris Daly to be his successor, and by Willie and Mary Ratcliff, publisher and editor of the San Francisco Bay View newspaper, by former presidential candidate and Congresswoman Cynthia McKinney, and by Lisa Gray Garcia, aka Tiny, the publisher of Poor Magazine and many more! You look like a winner to me! 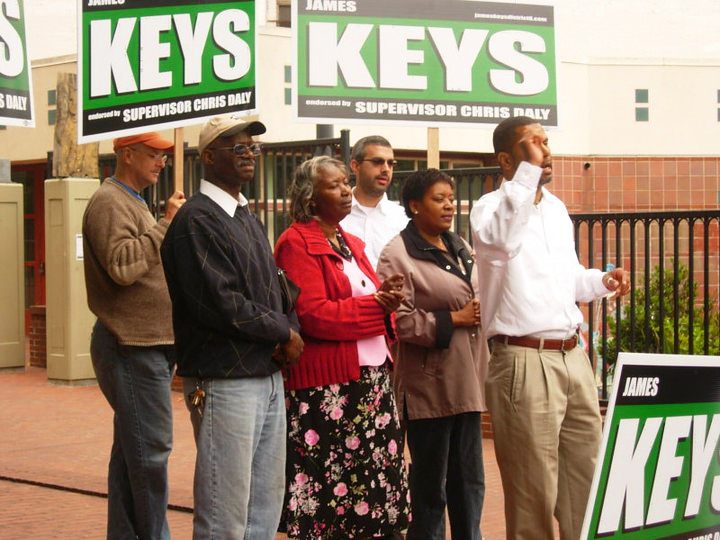 You can learn more about James Keys on his campaign website, JamesKeysDistrict6.com, where you’ll see his platform, bio, and his email address and phone number. Tell him to add your name as an endorser. You can donate to his campaign there through PayPal to put James on top of the race in D6! Also, check out both his pages on Facebook, James Keys and James Keys for SF Supervisor District 6. Do the Right Thing ! People Before Politricks! Mesha Monge-Irizarry, who founded and heads the Idriss Stelley Action and Resource Center, can be reached on ISARC’s bilingual crisis line at (415) 595-8251 or on Facebook. James Keys accepts Supervisor Chris Daly’s endorsement. San Francisco’s RING OF STEEL needs a Crosswalk! Previous articleThe trials of Rep. Maxine Waters: Ethics or payback? First, he belongs to the Democratic Party. The Democrats, like the Republicans have promoted wars abroad and a war against the well-being of people here in America. The two parties use people like Daly, Keys, and other "rebels" to promote an illusion that they have a vibrant and fair big tent. They do not. They have a black hole from which nothing but distorted token "victories" emerge. Second, speaking of distorted tokenism, Keys' endorsement of legalizing and taxing marijuana to pay for California Health is such. No one with any sense of justice can defend the draconian laws that criminalize marijuana– ruin lives, and promote organized crime. Rastafarians had a description of drugs as a "tour for the poor", well Keys' proposal is a "trip" for a state in economic crisis– a strange solution when one considers that the source of our crisis is not our lack of access to THC– but our lack of access to economic justice. We are being misdirected folks. Such prescription for our lack of health care is unlikely to change much; it will only help enrich many of the same ones who are robbing us of health and opportunity today. Lastly, we need leadership (good leadership. ), not the same old same old. Two children argue over a cake. One child says, "Let's split it." The other says, "I want it all!" An adult comes along to mediate, saying: "Why don't they compromise? The answer is to give a quarter to the first child, and three fourths to the second." San Franciscans need to deal with the problem of some people, a very few people, wanting it all. We need to completely break with corrupt corporate controlled parties and lead in a direction other than the one we have been going. To play the game as it exists is comfortable, but ultimately we lose. & sorry for typos…. neuropathic numb fingers, and no spellcheck feature on SFBayview.com…. Seriously though, if we lose all faith in the integrity of certain candidates to represent the voice of the People and serve their needs, what do you concretely propose to fight gentrification, landgrab and environmental racism ? I've had the privilege to find a listening ear and immediate action from Keys, over the years, way before he even thought of running for office to fight for us. Gave give you many instances upon request !